Two things I’m always tempted to do: bite off more than I can chew, and read books by authors I know I like. 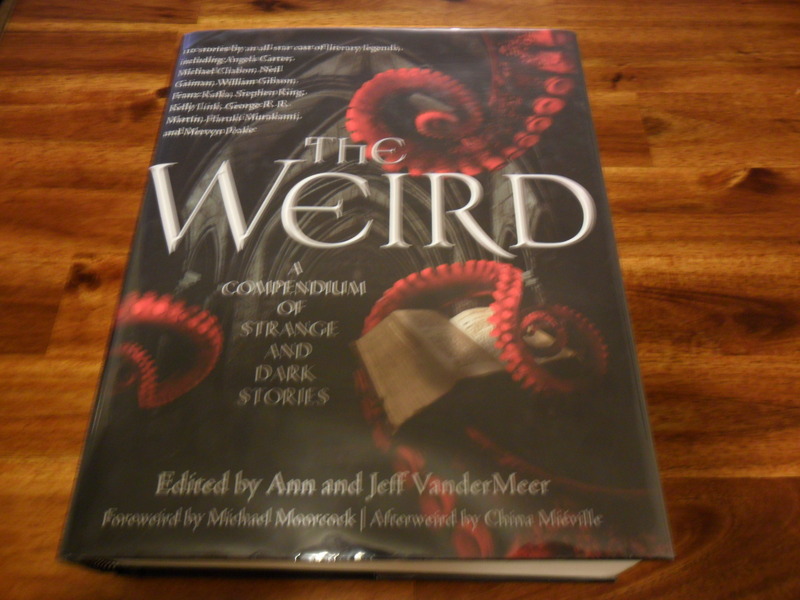 Taking a look at the monstrous 1000+ page Weird Compendium edited by The Vandermeer’s, it looks like I’m not the only one who enjoys biting off more than they can chew. In a podcast interview, I believe Ann Vandermeer described the exponential growth of the Weird project as “scope-creep”. With weirdness going back to 1908, the Weird Compendium is exactly that: buckets and buckets of weird stuff from all over the world, some of it translated for the first time into English. Two birds with one stone – more opportunities to post during Vintage month, and I’m going outside my comfort zone by reading folks I’ve never heard of. Are these stories science fiction? Sort of. They’re about things that couldn’t happen, that shouldn’t happen, things we don’t want to happen, things we can’t explain. It might not be pure scifi, but it’s certainly speculative, and that’s enough for me. I’ll read stories as I have time, and post my thoughts in bundles of a few stories. Who knows, maybe we’ll all discover a new favorite old time author! In the Penal Colony (1919), by Franz Kafka – I remember learning about Kafka in high school, but I couldn’t tell you anything definitive about him. This horror story is about a foreigner given permission to visit an island penal colony, and tasked with observing the judicial practices of the colony. None of the characters are named, everyone is referred to by a descriptive of what they do – the Traveller, the Officer, the Soldier, and the Condemned Man. The Officer, an ally of the previous Commandant, is showing off his punishment machine to The Traveller. It’s quite the machine, and the Officer is very proud of it and takes care of it lovingly. While describing how and why it works to The Traveller, the Officer reminisces about the good old days, when entire families turned out to view the executions, and young children were allowed right up close to watch the facial expressions of the slowly dying. This is a deeply horrific and disturbing story, but you simply can’t stop reading it. Not knowing enough about Kafka I’m sure I missed out on a lot of social commentary.